Derby’s Davon Wilson won the NVL shot put title with a throw of 46 feet, 1.5 inches on Monday in New Haven. NEW HAVEN — Derby’s Ja’Kwan Hale won two individual events and ran on one first place relay at the NVL indoor track championships Monday afternoon at the Floyd Little Athletic Center. Hale won the 300 (36.50) and high jump (6-0, tied meet record) and ran on the Red Raiders’ winning 4×400 relay with Kanye Bailey, Javan Guevara-Cragwell and Damian Caruso. Davon Wilson won the shot put (46-1.5) for the Red Raiders, who placed second to Watertown as a team in the boys meet. In the girls meet, Seymour’s Patricia Jurkowski won the 55 dash (7.69) and 55 hurdles (8.97) and Faith Rousseau won the high jump (5-0) to lead the Wildcats to third place as a team. Woodland won the girls team crown. Team scores: 1. Watertown 76, 2. Derby 63, 3. Kennedy 58, 4. Wilby 48, 5. (tie) Naugatuck and Sacred Heart 45, 7. Oxford 33, 8. Crosby 30, 9. Woodland 24, 10. Wolcott 22, 11. Torrington 12, 12. (tie) St. Paul Catholic and Seymour 4, 14. Holy Cross 1. 55 dash: 1. Edward Williams Jr. (Sacred Heart) 6.63; 4. Dylan Batlle (Oxford) 6.87; 300: 1. Ja’Kwan Hale (Derby) 36.50; 600: 1. Keith Caouette (Watertown) 1:26.89; 3. Javan Guevara-Cragwell (Derby) 1:29.43; 1000: 1. Elijah Lewis (Crosby) 2:46.26; 6. Peyton Mowry (Oxford) 3:00.37; 1600: 1. Nicholas Bendtsen (Wolcott) 4:43.49; 3200: 1. Nicholas Bendtsen (Wolcott) 10:25.45; 55 hurdles: 1. Edward Williams Jr. (Sacred Heart) 7.66; 4×200 relay: 1. Wilby (Dylen McKitty, Messiah Harling, Daniel Navarro, Leonardo DaGraca) 1:36.46; 4. Derby (Rocco Samoker, Damian Caruso, Branden Mclean, Xavier Ibrahim) 1:38.64; 4×400 relay: 1. Derby (Kanye Bailey, Javan Guevara-Cragwell, Damian Caruso, Ja’Kwan Hale) 3:40.16; 4×800 relay: 1. Kennedy 9:01.20; 5. Derby (Kanye Bailey, Cody Fleischer, Jake Cook, Chris Soto) 9:34.61; 1600 sprint medley: 1. Crosby 3:53.02; 5. Oxford (Everal Wallen, Ethan Stella-Mackie, Drew Adames, Peyton Mowry) 4:12.54; 6. 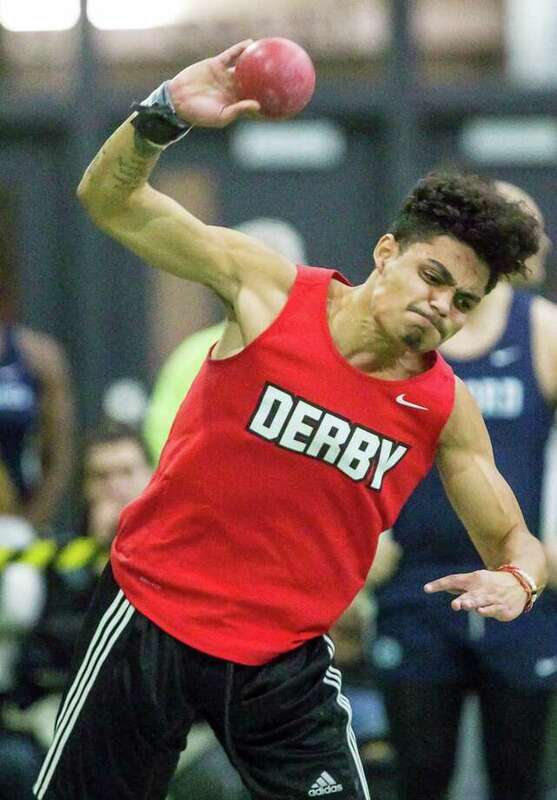 Derby (Rocco Samoker, Julian Delarosa, Chris Soto, Xavier Ibrahim) 4:12.56; high jump: 1. Ja’Kwan Hale (Derby) 6-0 (tied meet record); 2. Eli Manning (Oxford) 5-8; 4. Zyair Wali (Derby) 5-6; pole vault: 1. Zachary Koslosky (Naugatuck) 12-6; 4. Samuel Wolf (Oxford) 10-0; long jump: 1. Messiah Harling (Wilby) 21-6; 2. Dylan Batlle (Oxford) 21-2; 4. Javan Guevara-Cragwell (Derby) 19-11.75; 6. Branden Mclean (Derby) 18-7.75; shot put: 1. Davon Wilson (Derby) 46-1.5; 3. Dylan Pudelka (Oxford) 42-1; 4. Tim Buzik (Seymour) 41-3. Team scores: 1. Woodland 99, 2. Watertown 84, 3. Seymour 76, 4. Naugatuck 72.5, 5. Sacred Heart 31, 6. Wolcott 23, 7. (tie) Oxford and Derby 18, 9. Kennedy 16, 10. Holy Cross 14, 11. Torrington 7.5, 12. Crosby 6. 55 dash: 1. Patricia Jurkowski (Seymour) 7.69; 6. Suzana Imetovski (Seymour) 7.89; 300: 1. Raquel Rosa (Holy Cross) 43.50; 4. Patricia Jurkowski (Seymour) 45.32; 600: 1. Emma Zaccagnini (Watertown) 1:45.13; 6. Katie Bruno (Seymour) 1:53.93; 1000: 1. Jaden Young (Woodland) 3:13.84; 5. Maya Pekarek (Seymour) 3:37.35; 6. Emma Lobraico (Oxford) 3:39.18; 1600: 1. Kathryn Rodrigues (Wolcott) 5:18.27; 2. Cassidy Ngaopraseutsack (Derby) 5:34.92; 3200: 1. Kathryn Rodrigues (Wolcott) 11:40.89; 2. Cassidy Ngaopraseutsack (Derby) 12:08.09; 6. Sabrina Hancock (Derby) 12:56.28; 55 hurdles: 1. Patricia Jurkowski (Seymour) 8.97; 5. Faith Rousseau (Seymour) 9.91; 6. Leanne Sepanek (Oxford) 9.94; 4×200 relay: 1. Naugatuck 1:55.68; 4. Seymour (Amber Recine, Kaitlyn Sobin, Ashley Sobin, Suzana Imetovski) 1:57.01; 4×400 relay: 1. Watertown 4:26.55; 4. Seymour (Katie Bruno, Myah LaRovera, Kaitlyn Sobin, McKenzie Collins) 4:51.89; 4×800 relay: 1. Woodland 10:40.69; 4. Seymour (Erin Cronin, Grace Parkosewich, Madison Sheehan, Kayla Pollman) 11:58.91; 1600 sprint medley: 1. Naugatuck 4:39.99; 5. Oxford (Kate Wickenheisser, Olivia Lombardi, Emma Lobraico, Kenda Grillo) 5:03.68; 6. Derby (Montiyanna Crews, Skyler Curcio, Tierra McKnight, Annaly Khanthaphixay) 5:05.69; high jump: 1. Faith Rousseau (Seymour) 5-0; 2. Olivia Lombardi (Oxford) 4-10; 3. Enma Rousseau (Seymour) 4-8; pole vault: 1. Kelsey DeJesus (Watertown) 9-6; 4. Jenna Baxter (Seymour) 7-0; long jump: 1. Morgan Dodge (Watertown) 15-6.75; 5. Olivia Lombardi (Oxford) 15-0.5; shot put: 1. Jasmine MIchie (Woodland) 36-2.5; 2. Faith Rousseau (Seymour) 31-6; 3. Fiona Smith (Seymour) 29-1.5; 4. Niah Mesidor (Oxford) 29-0.